The city of Colwood is located 10 km west of downtown Victoria. This community which now claims a population of 14,687 (2009) was established in the late 1840’s as a farm to supply Fort Victoria. 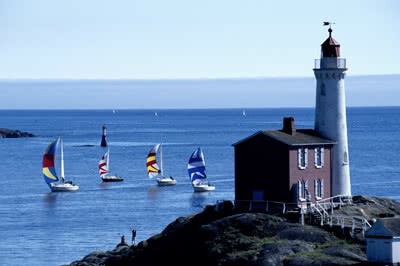 One of the first lighthouses constructed on the west coast is located in Colwood. 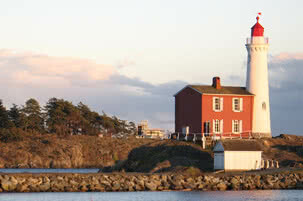 The Fisgard Lighthouse was built to guide mariners safely into Esquimalt Harbour, and is still in operation today. In the late 1890’s an artillery fort was erected on Fort Rodd Hill for the protection of Victoria and the Naval Yards at Esquimalt. You may visit this historic site and investigate the century old gun batteries, underground magazines, searchlight emplacements, command posts and more. There is knowledgeable staff available to show you around and tell some of the stories associated with this nationally historic site. James Dunsmuir, the former premier of British Columbia (1900-1902), purchased a 565 acre property on Esquimalt Lagoon known as Hatley Park. In 1906 he commissioned Samuel Maclure to design a home which he called Hatley Castle. The federal government purchased the property in 1940 from the Dunsmuir estate and converted it into a naval training academy which ultimately became Royal Roads. The property was leased by the provincial government in 1995 and Royal Roads University was launched, providing academic programs that focus on professional and applied fields. The name Colwood was bestowed on the farm run by Captain Edward E. Langford after his home in Sussex, England, and eventually was applied to the community which grew around it. For a long time Colwood remained a rural community, secondary to the nearby naval base and military academy, but as the population of Victoria grew and spread, Colwood became primarily a residential community, much as it is today. The municipality shares boundaries with Esquimalt, View Royal, Langford and Metchosin. Close ties bind these communities, as they share amenities used by all residents, such as the Victoria General Hospital, Juan de Fuca Recreation Centre, and large retail outlets. Within Colwood, there are business centres at Hatley Park and Colwood Corners to serve the residential neighborhoods like Triangle Mountain, Colwood Lake Estates, Colwood Creek, Wishart and Lagoon, among others. Public transit is efficient and the transportation corridors have been greatly improved in the last few years. 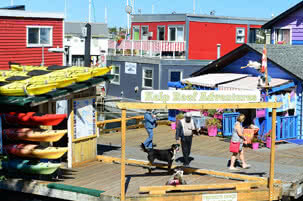 If you are considering moving to Victoria , you can learn more about the neighbourhoods of Colwood here. Colwood has its own Fire Department with both volunteer and career firefighters, and policing is provided by the RCMP. Water and sewer is supplied to most homes by the Capital Regional District (CRD), but some homes use wells and septic fields. The CRD also offers a curbside recycling program, check their website for schedules and allowable items. Garbage pickup is arranged by homeowners with private companies. Esquimalt Lagoon Migratory Bird Sanctuary – Located at the base of the Royal Roads property and next to Fort Rodd Hill/Fisgard Lighthouse National Historic Sites, this saltwater lagoon is a popular destination for birdwatchers. On the bluffs above the lagoon you can find some of the largest Douglas Fir trees in the province. One of these, known as the “Magna Carta Tree” is estimated to have been several hundred years old when an earthquake struck Vancouver Island in 1700, and still bears visible damage, but the tree continues to thrive and now measures close to two metres in diameter. The Juan de Fuca Recreation Centre – In 1994, hosted many of the events of the Commonwealth Games, which left a legacy of 98 acres developed for a variety of sports. There is skating, swimming, tennis, lacrosse, baseball, soccer, curling, beach volleyball, and lawn bowling facilities. There is even a golf course, velodrome, bmx track and jogging trails! The Galloping Goose Trail – A trail system with varying surfaces that crosses several municipalites in its 60 km route. 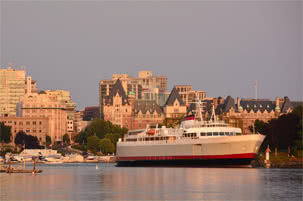 “The Goose”, as it’s affectionately known, connects with other trails to continue north on the Saanich Peninsula to the Swartz Bay Ferry Terminal – some 100kms in total. Hatley Park –And Hatley Castle, which has been carefully preserved in all its Edwardian glory, is open for guided tours. The park itself, containing heritage gardens, an Italian garden, a Japanese garden, and the rose garden, is open as well for tours and workshops. Colwood has come a long way from its humble beginnings as a farm, and with a nod to past history, continues to develop into a modern thriving city. Located on the southern tip of Vancouver Island, with one of the mildest climates in the country, Colwood has a promising future.